I recently trekked round the vast and cavernous Makuhari Messe for CEATEC, one of Japan’s largest tech expos and conferences. It was overwhelming and confusing, geeky and fun, and it seemed to be having a bit of an identity crisis, aptly encapsulated by presence of a giant robotic dinosaur. In summary, my leg muscles and my brain were exercised, and hunger levels were turned up to 11. On the way back, we ducked into Plena Makuhari shppping centre by Kaihinmakuhari station. My companion pointed at the nearest restaurant and moved towards it. I ignored him. 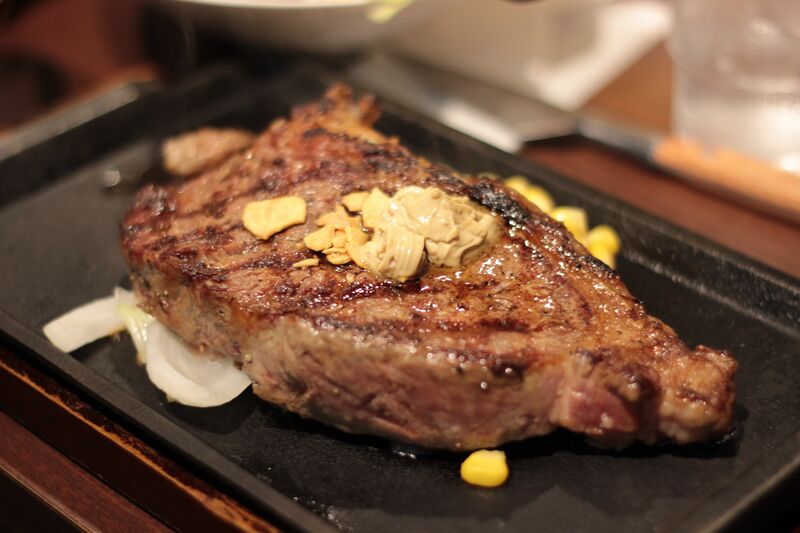 Ikinari Steak is the kind of place that will make you more than fine. 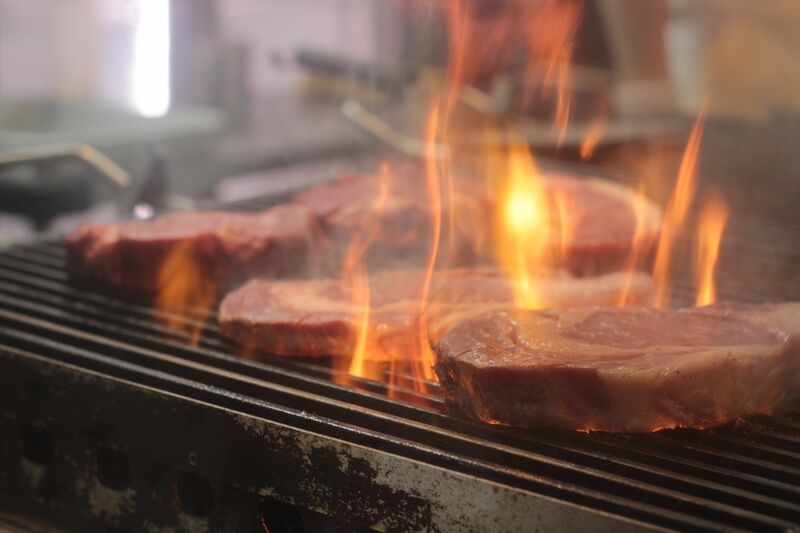 Steak lovers, unite. Here’s the beef on how to get your beef and not empty your wallet. 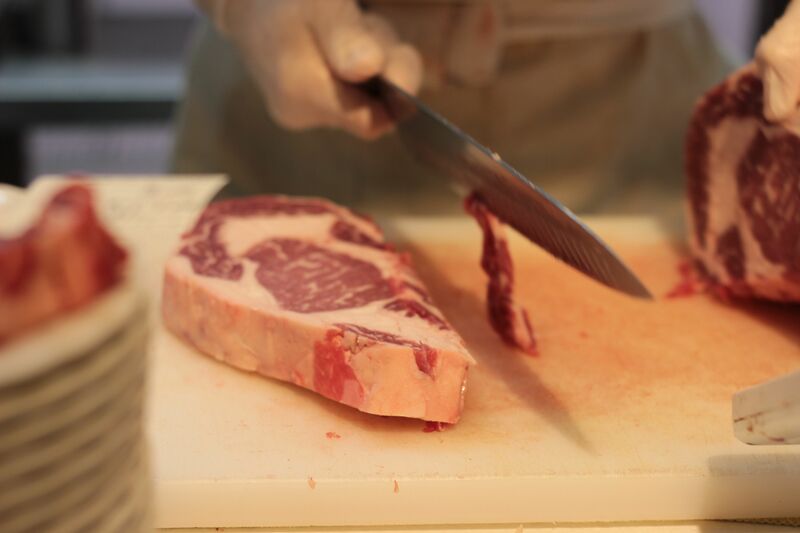 On the menu are three cuts of steak: ribeye is the cheapest at 5 yen/gram (excl. tax), followed by sirloin (7 yen/gram), tenderloin (8 yen/gram) and wagyu (Japanese beef) sirloin (10 yen/gram). What if you’re not sure? Want to examine the meat first? Not a problem. You get to personally order your steak from a man who will slice it in front of your eyes. This means you can eye up all the meaty offerings and have some idea of which looks the most appealing to you. Each cut has a minimum recommended amount, which probably acts more like a requirement. For example, they recommend that you order at least 300g of ribeye. Given that Japan has a reputation for serving a tiny 100g steak with a million unwanted side dishes for around 10,000 yen, this was my idea of heaven. Of course, the proof is in the taste. I ordered myself a ~300g sirloin (2,382 yen), medium-rare, and my companion took a ~400g ribeye (2,424 yen), also medium-rare. With that we ordered an ordinary but serviceable side salad (270 yen) and some peppery but pleasant fried rice (216 yen). And we stood, shifting our weight from foot to foot, and waited. The steak is excellent, truly excellent. My knife sunk into the tender flesh and the inside glowed a soft pink, demonstrating that the chefs at Ikinari Steak have a firm concept of medium-rare, which is frustratingly hard to find in the UK. The taste was just as it should be – pure beefy heaven, marbled with soft fat that melted and rolled over the tongue. The ribeye was also very flavoursome but wasn’t quite as tender. 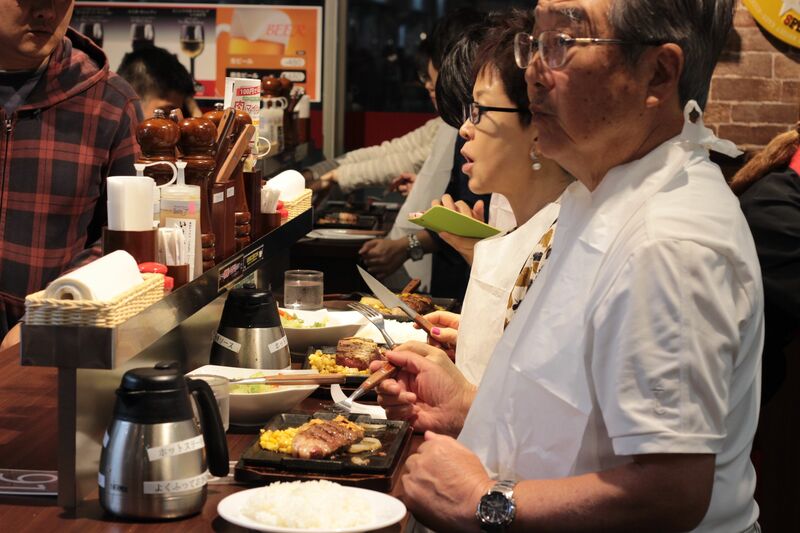 Eating whilst standing does not make for the most comfortable experience – Ikinari Steak would have done better to operate a timed seating rota to keep their costs down. But the steak is so good that your focus will be on your tongue and your stomach, not on your feet (or any awkward arm manoeuvres to scoop food from plate to mouth). Ikinari Steak have a whopping 14 branches across Tokyo, with their 15th opening in Akihabara Manseiabashi on October 30th (yes, this Thursday) and their first Osaka branch opens on Wednesday (October 29th). 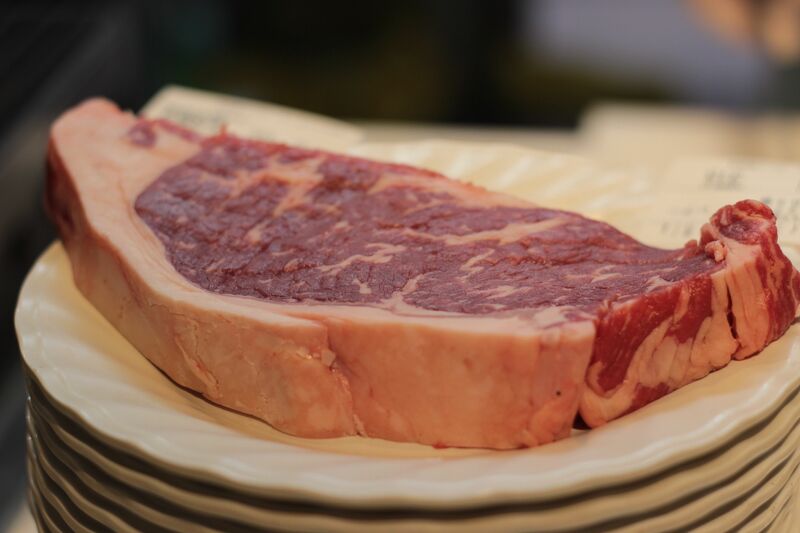 Basically, there is absolutely no excuse why you should not be eating great quality steak very cheaply. And for those who want to have their steak even cheaper, pay a visit at lunch time for fixed cuts of steak or the ‘Wild Steak’ at 1,050 yen for 300g (excl. tax), which includes soup rice and salad. 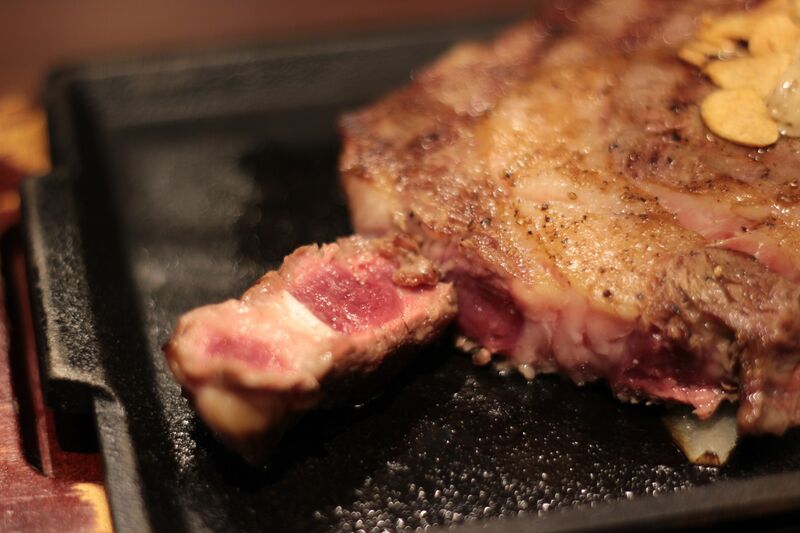 Ikinari Steak 5/5 – Pure beef heaven. Head there if you want cheap steak with no frills and you’re prepared to stand. Beef lovers will not be disappointed. Food 4.5/5 – The steak is beautiful. The sides are good but not worth raving about. But you didn’t come for the salad, did you? Service 5/5 – We were shown to our standing places and helped through our order by a very friendly lady. The guy at the meat carving counter was very obliging. Top marks. 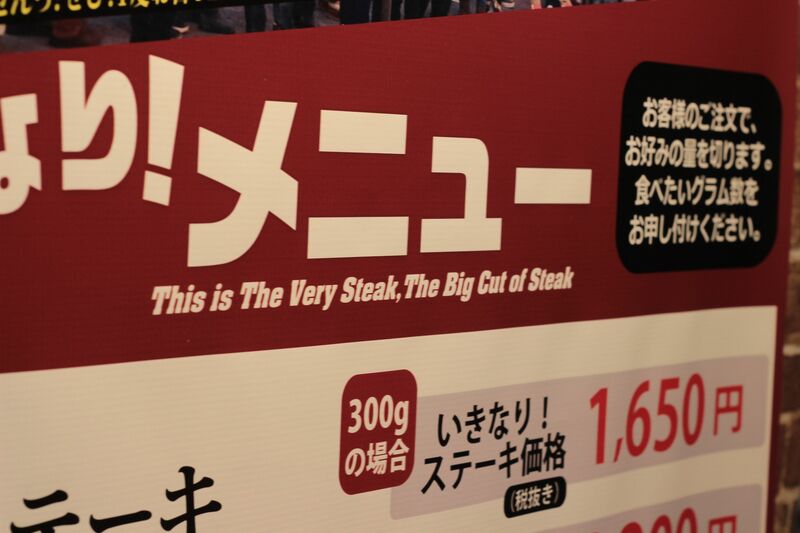 Value 5/5 – 400g of great steak for under 2,500 yen? Pick your jaw off the ground! Atmosphere 3/5 – Very busy in a welcoming way. But it is a place to shovel food to face and then leave.